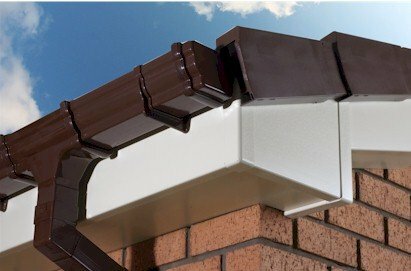 Cream Ash Effect Effect Foiled Grained Fascias & Soffits. Description: 175mm Cream Ash 16mm Full replacement 5m fascia boards. No backing timbers required. (External size) Colour: Cream Ash Effect Dimensions: 16mm x 175mm x 5m Features: Reflects 80% of the suns harmful rays 12 times thicker than traditional foils Superior em.. Description: 225mm Cream Ash 16mm Full replacement 5m fascia boards. No backing timbers required. (External size) Colour: Cream Ash Effect Dimensions: 16mm x 225mm x 5m Features: Reflects 80% of the suns harmful rays 12 times thicker than traditional foils Superior embosse.. Description: 400mm Cream Ash 16mm Full replacement 5m fascia boards. No backing timbers required. (External size) Colour: Cream Ash Effect Dimensions: 16mm x 400mm x 5m Features: Reflects 80% of the suns harmful rays 12 times thicker than traditional foils Superior embossed eff.. Description: Cream Ash Fascias Corner Joint for use with 17mm Cream Ash Fascias Board Colour: Matching Cream Ash Dimensions: 500mm Long .. Description: Cream Ash 500mm Fascias Joint for use with 17mm Cream Ash Fascias Boards Colour: Matching Cream Ash Dimensions: 500mm Long .. Description: General purpose flat board Colour: Cream Ash Effect Finish Dimensions: 9mm x 150mm x 5m Features: Reflects 80% of the suns harmful rays 12 times thicker than traditional foils Superior embossed effect over traditional foils Woodgrain effect evident by touch and sight .. Description: General purpose flat board Colour: Cream Ash Effect Finish Dimensions: 9mm x 200mm x 5m Features: Reflects 80% of the suns harmful rays 12 times thicker than traditional foils Superior embossed effect over traditional foils Woodgrain effect evident by touch and sight .. Description: General purpose flat board Colour: Cream Ash Effect Finish Dimensions: 9mm x 300mm x 5m Features: Reflects 80% of the suns harmful rays 12 times thicker than traditional foils Superior embossed effect over traditional foils Woodgrain effect evident by touch and sight .. Description: General purpose flat board Colour: Cream Ash Effect Finish Dimensions: 9mm x 400mm x 5m Features: Reflects 80% of the suns harmful rays 12 times thicker than traditional foils Superior embossed effect over traditional foils Woodgrain effect evident by touch and sight .. Cream 30mm Fixing Pins for use with Cream Ash 9mm flat boards. Average content of 100 pieces per box. .. Cream 65mm Fixing Pins for use with 17mm Cream Ash fascias board average content of 100 pieces of pins per box. .. Description: Interlocking cream tongue and grove cladding fixes into an edge trim, idea for creating a made to measure caravan skirting, just build your timber frame and use this durable product to clad the under space of your caravan. Create a professional finished look used in conjun.. Description: Use this product in conjuction with Cream 300mm Tongue & Groove Soffit- product code - GSB300C to create a professionally finished made to measure caravan skirting. Dimensions: 10mm x 5m .. Description: Cream Ash Effect H Section for use with 9mm Cream Ash Flat Board Colour: Cream Ash Effect Foiled Finish Dimensions: 5m Lengths ..